NOTE 23 January 2014: New posts are no longer posted to this blog. New stuff at my new blog, http://urbanadventureleague.wordpress.com/ Please go there! All old and new posts are there, and you can also comment, too! I've become quite the "gadget geek" when it comes to camping. This is partly because I want to familiarize myself with various options so I have knowledge of these things when I write bicycle touring guides and give bicycle touring workshops. And partly because I'm obsessive. I'm also obsessive about coffee. I want to, no, demand good coffee when I'm touring. Instant will not do. 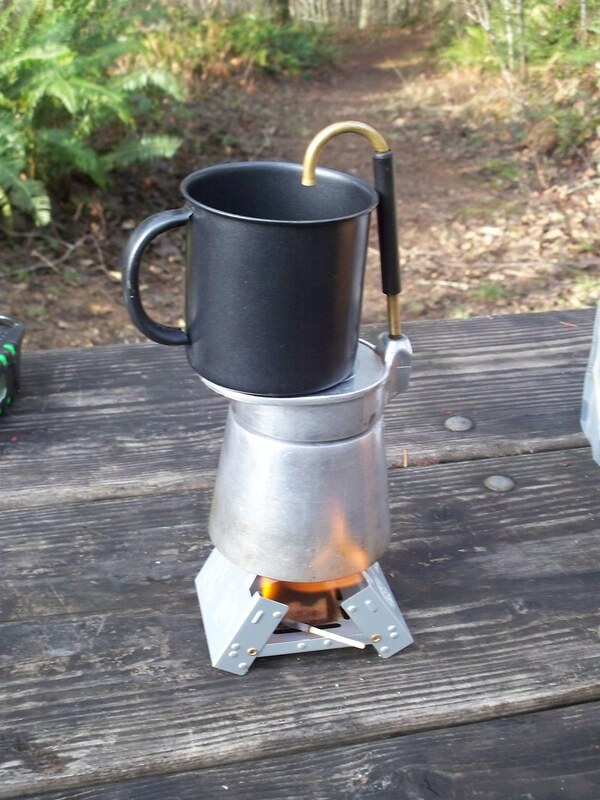 Over the years I have tried many methods of camp coffee preparation; from cone filters to infusers to french presses (press pots) to moka pots (stovetop "espresso" makers.) I've found that the infuser method is the easiest to do on the road as my infuser nests inside my coffee mug. I like moka pots best but they take up too much room. So I'm always on the lookout for camp coffee gadgets. A vintage version of the Esbit "Kaffeemaschine". Design has not changed much, huh? I think if I ever started a Kraftwerk cover band, I'd call it Kaffeemaschine. The Esbit coffee maker has caught my eye. Esbit is a German stove maker that specializes in solid fuel stoves. 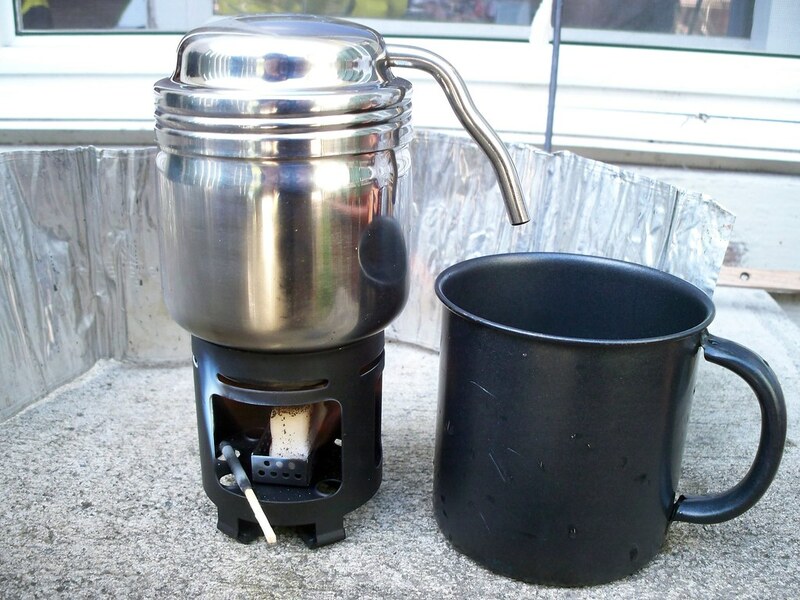 (Esbit stove and solid fuel stove are pretty much synonymous, though Esbit also makes alcohol (spirit) stoves.) And it's a moka pot! I like the integrated stove, stainless steel, and retro design. But I already own a camping moka pot made by GSI so I couldn't justify the $50 price tag for the Esbit model. Then I found it at the clearance price of $12.50 at Sierra Trading Post. And before the blink of an eye I had ordered it. I received the coffee maker on Monday and wasted no time testing it. Like other moka pots, the Esbit coffee maker has a fresh water reservoir (F) at the bottom, nearest the source of heat. Sitting atop that reservoir is a basket (B) with a funnel for coffee grounds. Unlike other moka pots, the Esbit has a separate filter (C) with separate gasket (D) that sits atop the basket, other moka pots have the filter integrated into the basket. Standard moka pots have another reservoir above this where the brewed coffee goes. 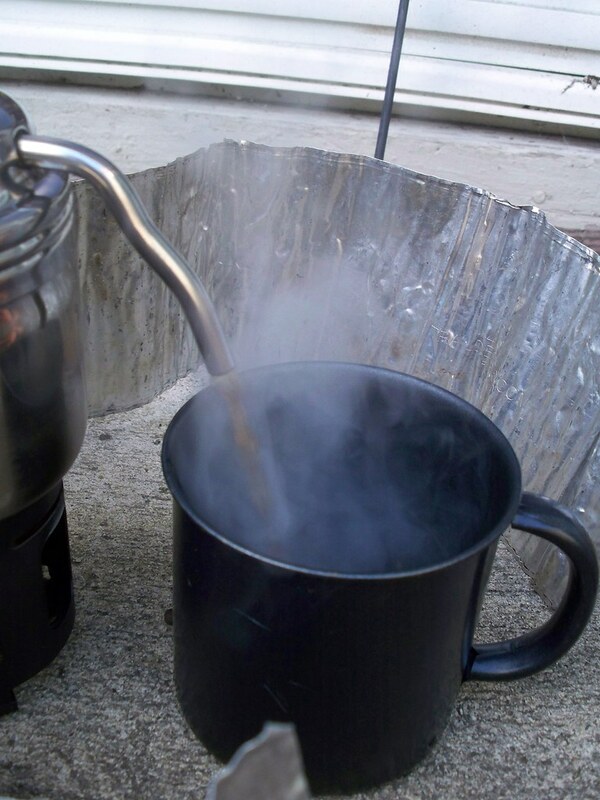 But camping moka pots instead have a nozzle (E) for brewed coffee. Beneath this nozzle is where the cup to collect coffee is placed. Other camping moka pots place the mug on a shelf above the fresh water reservoir, which means the cup gets hot as it is over the source of heat. (See photo above) Just try to drink out of that cup! With the Esbit the cup stays on the ground, meaning (theoretically) one can drink the coffee straight from the cup. As I said above, the Esbit coffee maker has an integrated stove (A) which uses Esbit solid fuel tablets. I was hoping the stove would be big enough so I could use my Trangia alcohol fuel burner, but not so. 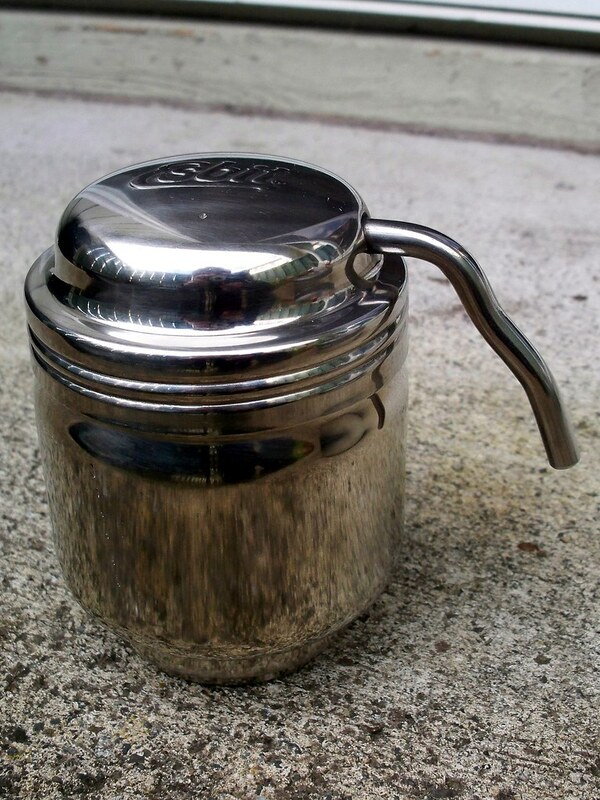 A "pop can" stove might work. The nice thing about the stove part is that it nests inside the coffee maker when not in use, making it more compact than my other camping moka pot. And having its own stove means I can use my Trangia stove for other things in the morning other than coffee preparation. And the operation went smoothly. It took about eight minutes to brew coffee, about the same amount of time if I was using the GSI moka pot. The brewing process used up most of a fuel tablet, and the flame was easily doused with the provided "cap" extinguisher. As for the coffee, it was a bit on the weak side. I'm going to need to play around with roasts and grinds to get the optimal strength. Will this be a regular part of my kit? I don't know yet. It all depends on whether or not I get the brew strength right and how much room it will occupy in my bags. It might not be an all the time thing but more for short excursions. Nevertheless, I think it's pretty cool! The weight of this is 9.8oz/279g. With the fuel holder and in its protective mesh bag, the weight is 11oz/312g. Hmmm Looks good to me. Thanks. I like to see gear reviews by "normal" people. And I'm always interested in different ways to make coffee. One friendly suggestion: I think a picture of coffee maker and stove in their stowed configurations would be useful. As well as an estimate of their weight. (Well, I know how much an Esbit stove weighs). Size and weight are big factors to consider, for anyone that isn't camping out of their car. Nick, good idea! I'll try to shoot a photo of it packed soon and get the weight. Just did it! Check out the Update at the bottom of the post! Thanks! I appreciate the in-depth review. Man I am so with you on having real coffee on tour (PNW represent I s'pose) but after trying a few things I long ago settled on just using a permanent filter (this one: MSR MugMage ). Fits in my titanium mug I'm going to have anyway and I think they pretty much make as good as coffee as anything (not too far off from the ceramic cone filter I use at home really. These filter/infusers are designed to be used with Nalgene bottles, but the threading mostly matched up on my Klean Kanteen coffee mug. It produced a good cup, equivalent to French Press. It's the system I now most commonly use. I love this little guy. I just ordered 2 (one for me and 1 for gift)from Sierra Trading Post for $22.50 plus 20% off for a total of $18 each before s/h? I also saw that Sears is trying to sell them for almost $100 each. One trick I learned is to make sure the basket is completely full of grounds so the steam and water can't find any shortcuts to the spout. I think you wrote a great review, wish more people would write reviews like that. I saw that the price went back up from $12.50 to $22.50 on Sierra. Online catalogs are so weird. Sears is a joke these days. I was born and bred in the diminutive State of Connecticut and have been living in Portland, Oregon, Cascadia, for a decade. I'm an "artist" (aka bohemian that occasionally draws) and used to work for a hostel. I've been drawing the mini-comic TEN FOOT RULE since 1996, which is a very long time in mini-comic years! I do a lot of flyer/poster art for various projects in Portland and around the world. I'm involved with the bicycle community in town and ride almost everywhere (don't own no car!) I love bike touring! I live with my sweetie April somewhere in the mysterious reaches of SE Portland. NEW URBAN ADVENTURE LEAGUE BLOG!!!!!!!!!!!!!!!!!!!!!!!!!!!!!!!!!!!!!!!!!!!!!!!!!!!!!!!!!!!!!!!! Copyright 2005-2012 Shawn Granton. PO Box 14185, Portland OR 97293-0185. Please ask before you use. Picture Window theme. Theme images by kamisoka. Powered by Blogger.